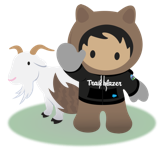 I joined Salesforce in January 2016 to be a part of this incredible organization and build community with Erica Kuhl, Holly Firestone, & the amazing Trailblazer Community team. ####In my role as Community Manager, I'm focused on the intersection of Product and Community. It's an opportunity I couldn't be more excited about. Have questions? Please reach out and let's talk.####Follow me on Twitter: @lexpisani####Get to know me: ####- I'm from Massachusetts and that's pretty much the best.##- Basketball, ice cream, volunteering, cooking, hiking, buffalo chicken, & Boston sports make me very happy. ##- Live music is my favorite. Alex Pisani hasn't posted any ideas yet.